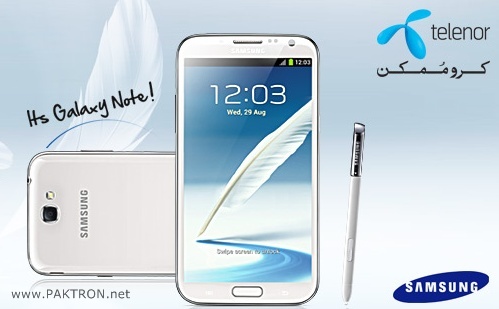 Telenor Pakistan has announce the availability of Samsung Galaxy Note II for its prepaid and postpaid customers. Telenor Pakistan exclusive deal with Samsung for flagship handset of the year - Samsung Galaxy Note II. 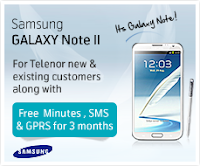 Telenor offer Samsung Galaxy Note II with 3 months free Unlimited internet* (* Fair Usage Policy) and 200 onnet minutes, 200 SMS and 100 international minutes all for three months. Samsung supports 2G, 3G and 4G LTE network and is equipped with 1.6 GHz quad-core processor its OS is Android 4.1 (Jelly Bean) with Memory of 16GB User memory + 2GB (RAM) & microSD slot (up to 64GB). This is just a news, click here for complete details and specifications. Telenor should offer this smartphone at discounted price in Pakistan.